Missed eCourts 2018? Never fear, selected conference sessions are available to stream now. Watch Judge Alexis G. Krot of the Michigan 31st District Court (Hamtramck) speak on an online dispute resolution (ODR) panel from the comfort of your office or on the go! On Tuesday, December 12, 2018, Judge Krot presented on an ODR panel. She spoke about the 31st District Court’s experience using Matterhorn ODR for traffic ticket resolution. 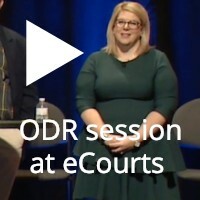 The 31st District Court launched ODR in 2016 and members of the public have used its ODR platform to resolve over 1,500 cases to date (as of January 2019).